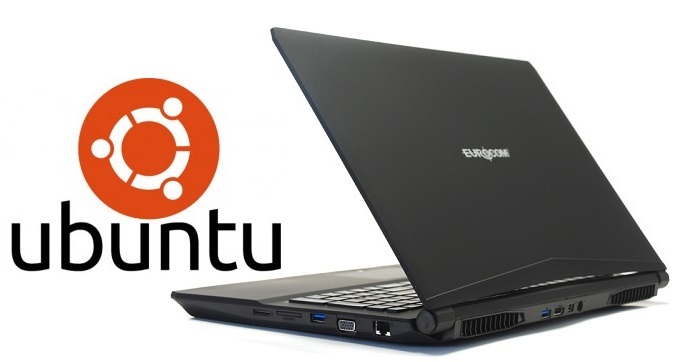 Eurocom is now offering the 15.6” Ultraportable, High Performance Shark 4 laptop with Ubuntu 14.04 LTS and USB Key backup as another Operating System choice in addition to Windows choices and Intel Core i7-4720HQ, NVIDIA GeForce GTX 960M, 16 GB memory, 3.5 TB storage and TPM 2.0. In the ongoing adventure of offering Eurocom customers as much choice and freedom as possible, we are pleased to announce that customers can now order the EUROCOM Shark 4 with Ubuntu 14.04 LTS Operating System. Eurocom is supplying a USB key for backup or fresh reinstall. Upgradeability is a core feature of all Eurocom systems; the Shark 4 is no different with upgradeable memory, storage, display, wireless card, keyboard and now the Operating System at purchase time. The EUROCOM Shark 4 supports two memory modules for up to 16 GB of DDR3-1600 memory and one M.2 SSD SATA PCIe Gen2 x2/x4 and two 9.5 mm HDD/SSD SATA for up to 3.512 TB of storage. EUROCOM Shark 4 Graphics performance comes from an NVIDIA GeForce GTX 960M with 2 GB GDDR5 memory and Intel HD Graphics 4600. The GPUs are switchable between iGPU and dGPU using Microsoft Hybrid Graphics to give customers great performance and outstanding battery life. The EUROCOM Shark 4 comes with a high quality white backlit keyboard with three brightness settings that can be easily changed through a keyboard hot key, for easy typing in the dark. X-structure key technology is utilized for a great typing experience. The EUROCOM Shark 4 has a streamlined “V” design theme for a sleek looking chassis that is just over 1 inch thick and weighs only 2.5 kg so users can easily slip the Shark into their backpack or handbag. The Eurocom Control Center gives users complete control over their Shark 4 by allowing them to control the performance, system fans, power saving and entertainment. In addition to the Control Center, the Shark 4 also has the Sound Blaster Cinema 2 application to allow user control over the sounds system. Linux based operating systems, such as Ubuntu, are a great alternative to leading operating systems because they can be less prone to virus attacks, are very secure, while having a stylish and intuitive interface. Linux distributions like Ubuntu give users a streamlined experience that they can really make their own. With Ubuntu, users become part of a massive, open source community that provides support through millions of other fellow users. · Display: 15.6 inch (39.62cm) 1920-by-1080 pixels FHD IPS display; eDP; Run up to 3 active displays with the 15.6” 1920x1080 ips edp display and the HDMI, VGA and Mini DP ports.